"Nice site with good resources for homeschooling. Keep it up!" "Great name, like the littleusedstore name. You should put more items to make it more interesting. Best of luck!" "Your site is so well designed and very attractive, I felt as I were getting a personal tour. lovely What an adventure anyone cou;d have, and reasonable prices.You have certainly helped to give a sparkling future to the travel industry. The locations are inviting.A job well done.Please visit our store at http://sellingstation.ning.com/profile/JudyMay"
"Nice site, structured, and easy to find what you're looking for. Also a very smooth skin, well done :) !" "A cute site. Nice products. Loads fast enough even with a slower connection." "The site is designed beautifully, and the content is going to be of great help to the homeschooler AND those who might want to help the kids at home. In these toughening economic times, it makes sense to try and find the best value for your money, and I think you'll find a lot of value here if you're looking for educational materials"
"Nice site to get a list and to buy toys, trading cards, antiques, china replacements, movies, software, ink, books , and many more, I like it,"
"It's a store and more... The free information are simply superb, and the products in the store are very enticing. Well done & cheers!" "simple design but nice. the content is very good." "Cute site, fast load, will surely comes back." "Site opend fast and look great in side the links worked fine.."
"great site... saved to fav's ... will be back for edu stuff... we are homeschoolers"
"A very friendly looking site, the pages are really long though. It is cool that it had something for like everyone, even children. Although on like every corner theres a link to an off-site webpage. And it seems like some on the pages are in the wrong catagory, you have fun games and such, but they are under "contact". But, overall, it's acthally really cool. It's nice that you have a plug board and site submit thing and homeschool help and stuff, showing that you don't only care about your site like alot of people, and you care about others too." "Great site! Good layout and fast load! Very interesting and useful site, i love your site, bookmarked and will be back. Thanks"
"I didn't know that I could access a latin class here. Just take the time and it is here to help you learn." "Nice site for online shopping for edu productss.Liked d concept of used items for sale.."
"nice site for budget users wow." "Your store is unique and I found some timeless gently used pieces of china I could add to my collection. Enjoyed the variety of items you have for sale. " "I find this resourceful, informative site on this online edu. help thrift shop, very easy to navigate, quick uploading and nicely designed. I dig the free stuff too"
"I think you've an interesting concept but site can be thought out a little better to simplify ideas for visitors and showcase your categories better -- Just tweaking needed; otherwise good job!" "I took me a look see at your site, and found it to be quite interesting.I found the links to be well places,and easy to fallow.The Graphics are nice,seems to be well thaught out.The site was very easy to navigate.And some what informative. The info seems to be of a useful nature.I got to admit, it looks pretty darn good.Content was great and easy to follow.The presentation is good,Very impressive.Good layout that is not cluttered,with a good color scheme. http://cgi.ebay.com/ws/eBayISAPI.dll?ViewItem&rd=1&item=180306704542&ssPageName=STRK:MESE:IT&ih=008"
"I would consider moving categories, maybe into shopping category, you will get a little more quality traffic. Also you could add your products to ebay and have links from your website to the products as well. Or place on 1 product on ebay and link them to your website for more information, this will get quite a bit of traffic coming from ebay to your site. Best of luck"
"Very cool site! Site is well designed and easy to navigate. Pages as well as graphics load quickly. Site offers merchandise at good prices. Good work and much success to you!" Online thrift store gets great reviews. 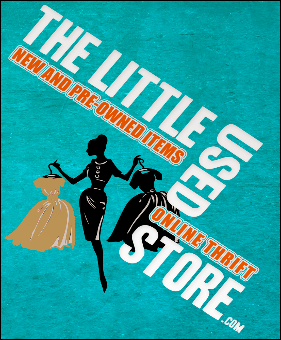 Visit the "Little Used Store" thrift store. Lots of hand picked items, something for everyone! If you would like to get a reviews page like this join link referral by clicking the button below.